Nvidia has a new marketing message. And this time, it's not all about graphics cards, but the CPU too. Essentially the company wants you to spend less of your new PC budget on that expensive high-end dual or quad-core processor, instead using your money to better effect by boosting your PC's performance with a better graphics card. 'Smart spending' is Nvidia's message of encouragement. 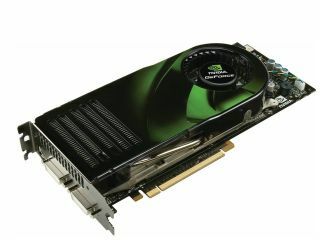 Nvidia tried to demonstrate that the performance gain between certain dual to quad core systems could be zilch. "You can get away with an E6600 [2.4GHz Intel Core 2 Duo]. It's at the right price, it's overclockable - it fits in perfectly," said Ben Berraondo, Nvidia's PR Manager for the UK and Northern Europe, speaking to journalists in London. Now, before we get all cynical, Nvdia does have a point. And it's rooted in benchmarks. A high-end processor only yields a few percentage points of increased PC performance versus the extra grunt gained from, say, a second 8800GTX card inside your PC. That can't be disputed, and is helped by the fact that multithreaded apps are as rare as a 7-inch single in Woolworths. The company has launched a new campaign to push the message out, dubbed 'Optimise PC'. At the very least it's indicative of the increasingly entwined relationship between the GPU and the CPU and Nvidia's expectation for the market in the years ahead. It isn't alone. Intel is talking the talk with Larrabee, while AMD and ATI have also mooted the Fusion multi-purpose PC processor for a while. "The industry is going down that route, but we're already there," said Berraondo. Nvidia is uniquely placed within the major GPU-CPU manufacturers - it only manufactures GPUs. Intel is the same, but it is clearly intent on gaining ground in the graphics market. AMD and ATI are already one whole. Why are things converging? What we're seeing is a movement towards incredibly powerful graphics processors finally being used for other stuff, and the CPU seemingly being relegated in status. The CPU won't disappear - it will remain essential. Nvidia is talking about rearranging things at a broader level than that; about "getting away from the traditional PC approach". That means changing the ATX spec, even if Nvidia proffers no practical ways to actually accomplish this. Nvidia hopes to persuade software vendors to produce more multithreaded apps which will, predictably, run better on Nvidia tech. It's launched the CUDA programming architecture, which James Morris has spoken more about in his recent TechRadar blog. This isn't just about gaming. Foat cited Adobe Acrobat's 3D acceleration tech as a key example. When asked to name others involved he declined, simply adding "we're working with massive ISVs [Independent Software Vendors] on this". Even though details of Larrabee are rather early, Nvidia clearly believes that Intel doesn't have the graphics know-how to pull it off - even if it does have the ad budget. "We're never going to beat their marketing programme," admitted Foat. Journalists at the event were accused of giving too much credit to Intel, but who's to say it won't chuck $100 million at it, get the right people and sort its graphics department out? "They can't make a graphics driver to save their lives," said Foat. Intel wouldn't be talking up Larrabee if it "didn't think this was the future of home computing," added Berraondo, also citing the acquisition of ATI by AMD as another sign the industries were becoming more intertwined. At IDF earlier this month Intel said the end was nigh for PC graphics as we know it. Nvdia is hoping to persuade the industry of its ideas first, but there's one problem with that. System builders build PCs that people want. And people still look for more powerful processors. The PC industry has only itself to blame for that.